Director Kristin Tyrrell will lead participants through a workshop to understand the style of the play as well as learn to connect to the story and communicate it clearly to the audience. This is a great way to learn more about how to play comedy and prepare to audition. 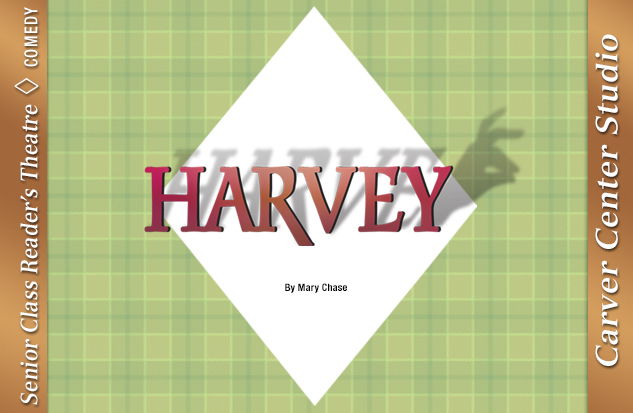 The Pulitzer Prize-winning comedy is the story of a perfect gentleman, Elwood P. Dowd, and his best friend, Harvey - a six-foot tall, invisible rabbit. When Elwood begins introducing Harvey around town, his embarrassed sister, Veta Louise, and her daughter, Myrtle Mae, decide to commit Elwood to a sanitarium. But a mistake is made and doctors mistakenly commit Veta instead of her mild-mannered brother Elwood! Eventually, the error is realized, and a frantic search begins for Elwood and the invisible rabbit, which ends with Elwood appearing, voluntarily, at the sanitarium. Veta finally comes to realize that she loves her brother and his invisible best friend just as they are, and doesn't want either of them to change..
Our Senior Class Reader's Theatre program was established eleven years ago as a way of providing more performance opportunities for our veteran actors. Needless to say, this reader's theatre program has proven to be very popular with volunteers and patrons alike. It is designed to meet the needs of actors 50 and older. All productions are "reader's theatre" in nature, lines and lyrics are learned but not memorized.